Here's my arrangement of the French Renaissance carol that was featured in Banjo Newsletter a number of years ago. The most challenging aspect of an arrangement like this on the banjo is trying to keep two voices - the top melody and the bottom bass - clear and present at the same time. 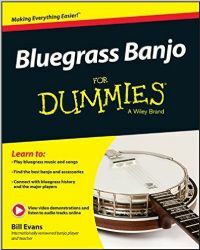 Easy for classical guitarists, hard for banjo players! Merry Christmas everyone!! Here's my solo arrangement of "Christmas Time Is Here." I worked this out several years for my "Banjo Newsletter" column - I hope you enjoy this version and Happy Holidays to everyone! Composer Johnny Marks also wrote "Rudolph The Red Nosed Reindeer!" Here's a Scruggs-oriented arrangement that ran in BNL a number of years ago. Have a great holiday season everyone! Merry Christmas everybody! Here's my arrangement of "Let It Snow, Let It Snow, Let It Snow," from a BNL column from a few years back. Wishing you joy and music this holiday season! This tune is from my CD "Bill Evans Plays Banjo" and features Rob Ickes on dobro, John Reischman on mandolin, Jim Nunally on guitar, Greg Spatz on fiddle and Missy Raines on bass. I was thinking of Sammy Shelor's great playing when I started working on this tune, so I named it after his Virginia hometown of Meadows of Dan. After the release of my CD, I discovered that the great clawgrass player Mark Johnson had also written a tune and given it the same title. The first part of the tune is in the key of A but the second part modulates to F and features a good deal of single string work - the toughest thing for me to do on the banjo! Here's a live version of the title tune from my first CD for Rounder. This was recorded at the Freight and Salvage Coffeehouse in Berkeley, California on November 3, 2003. Band members are Jim Hurst on guitar, Ron Stewart on fiddle, Roland White on mandolin, Missy Raines on bass and yours truly on banjo. This version is a bit slower than the Rounder CD version and makes for an interesting comparison. The banjo is in Dm tuning on this tune - a D F A D. I hope you enjoy! Here's one of the 196 tracks from "Parking Lot Picker's Songbook: Banjo Edition," a brand new book from Mel Bay Publications, co-written with Dix Bruce. In this book, we feature over 225 bluegrass, old-time and gospel favorites. Each melody of each song is presented in conventional music notation and banjo tablature, with chord progressions and complete lyrics. The really great thing about this set is that two CDs accompany the book - you can hear Dix and I perform a verse and chorus of every tune. I use backup techniques that I teach on the AcuTab "Power Pickin'" DVD series. Here's a sample of what these tracks sound like. You can find out more about the book by visiting nativeandfine.com and clicking on the "Store" link. Thanks for your continued support!